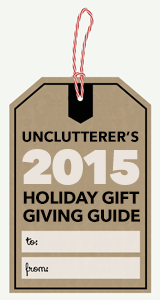 Starting today and going through Dec. 7, we will be running posts for our annual Unclutterer Holiday Gift Giving Guide. What I’m finding a little difficult to believe this year is that it’s our NINTH Guide and the ninth one I’ve organized as the site’s editor-in-chief. Putting together the 2007 guide was my first big project after taking over the chief position in November of that year. How has time passed so quickly? 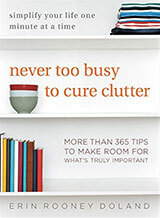 As in years past, you can expect there to be guides this year about experience gifts (fun and clutter free), highly utilitarian gifts (gifts that in the right hands will never be clutter), and organizing gifts (oh how I love gifts that help people to be more organized). There also will be suggestions for giving gifts to kids and our ultimate gift of the year. This year’s guide is fun and useful and I really think you’ll find it inspiring. Speaking of inspiration, if you need a little right now, let me direct you to our past Guides: 2007, 2008, 2009, 2010, 2011, 2012, 2013, and 2014. Clean out your refrigerator and pantry first. Free-up space for leftovers and food you’ll prepare ahead of the meal by getting rid of anything that has expired and/or gone bad. Poll your guests now to see if anyone has food allergies, intolerances, or special dietary needs. Also ask if anyone needs transportation, so you can coordinate travel requirements ahead of time. No need for last-minute surprises that can easily be avoided. Meal plan for the entire week, not just the Thanksgiving meal. Figure out today what you’ll be eating all next week so you aren’t stressed about meals next week. Grocery shop early Saturday or Sunday morning. You don’t want to have to fight the crowds of last-minute grocery shoppers, so get this chore out of the way early. Make a detailed schedule at the same time you make your to-do list. Include things like cleaning your home and automobile (I like to do that Monday night) and looking over your Thanksgiving meal plans to determine what can be made ahead on Tuesday or Wednesday (desserts, like pies, are great to make ahead of time). A detailed schedule is important for keeping your to-do list from being overwhelming. Delegate! If you have children, put them to work taking care of some of the to-do items. Everyone who lives in your home should be involved and know their responsibilities ahead of time. Breathe. Remember that Thanksgiving is about coming together with people you love to be thankful for the good things that happened this year. Take time to enjoy being with your people. And if your people are making you feel like you can’t breathe, take yourself outside on a walk. And, as a last bit of news, our offices will be closed next Thursday and Friday so everyone can enjoy the holiday. In addition to lists, one of the things I always do is to make a list of all the dishes I’m making/heating on the actual day, then I indicate, what appliance I’ll be using (stove, oven, microwave), how long it will take, temperature setting if oven, and what time to put it in. For things like salad, I will pull the bowl and then place all the items in it that will go into the salad. I’ve yet to burn/overcook/undercook anything and if someone comes in to ask if they can help, it’s really simple to point them in the right direction. I have lists on my computer that I use every year (and update every year for the following year). 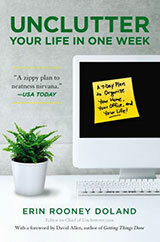 One list is a to-do list with the headings “Two weeks out,” “One week out,” “Two days ahead,” “The day before.” Last year, for the Big Day itself, I wrote a “count down” list of what to do at what time so that it all came together in the end. My menu, which is almost identical from year to year, is also there, so that it all gets to the table. I have a shopping list for each store I use, because some stores are better for somethings than others). There is also a list, taped to the microwave, titled, “Do you want to help?” intended for my grown children, but available to any guest. It has suggestions for things like making drinks, taking the garbage out and the recycling to the basement, clearing the table, etc. I don’t say anything about it, but if people ask, I point them to the list. One of the most useful things I do (pretty early in the morning!) is to look at the menu and find the pot or pan and the serving dish for each item and to stick a post-it with the name of the item on it. That way no one is putting the carrots in the only pot that is big enough for the potatoes (or some such). And the next day I write my notes: who came, what new recipes I tried (and whether they worked! ), what I would change for next year, and maybe a few comments about what kind of day it was, anything amusing that happened, what I was grateful for. Although my lists are probably more extensive for Thanksgiving, I have been developing them for other holidays as well. This has save me from re-inventing the wheel each year!